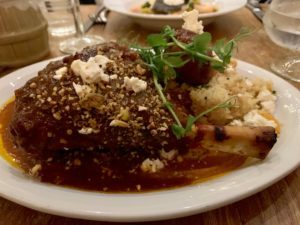 I have written a previous review of the excellent gluten free dinner at restaurant, The Three Birds in Bruntsfield. However, my dinner and experience was so good last night, I thought I’d do a short update. I have concluded I need to visit much more given how excellent it is for food and for GF. As you know from the other review, the Three Birds is the first of three sister restaurants, which also include The Apiary in Newington and The Educated Flea in Broughton Street. What you will also know, is that the menu works like this: if it is NOT gluten free it can be adapted, so is marked with an asterix. Other than that and the bread for which “normal” people can opt, everything on the menu is gluten free. It is an enlightening and relaxing dining experience, particularly if you, like most coeliacs, avoid sharing platters like the plague. An evening with a few friends, a little wine (no dry January here!) and discussing books was just brilliant! And we began with a selection of the little plates (in a box on the left hand side on the menu) to share. Feta and pistachio and carrot dips, with flatbreads and seeded chicken strips – all GF too. So sharing was a delight. Our mains were gluten free too, even though my fellow diners were gluten-loaders. The delicious halibut with prawns and tomato and the huge and delicious lamb shank with quinoa were both completely excellent. As pretty much everything is gluten free, other choices included some vegan options, lamb rump, chicken supreme stuffed with leek & spinach, roast potatoes, sautéed kale, pickled prunes, chestnut mushroom & sherry cream – gosh that sounds good! Puddings have some good gluten free options too, including rocky roads, banoffi mess, chocolate and orange cake – and that brilliantly quirky ice cream menu. Too full from my lamb, I resisted, but my fellow diners enjoyed some truly amazing concoctions (peanut butter and jam ice cream? Yes please!). I enjoyed another visit here so much, it reminded me to go again! The atmosphere and service were terrific and friendly and dining here is more than just great food – it is simply a pleasure. Put any of Three Birds, Educated Flea or The Apiary on your gluten free dining list and give it a go!